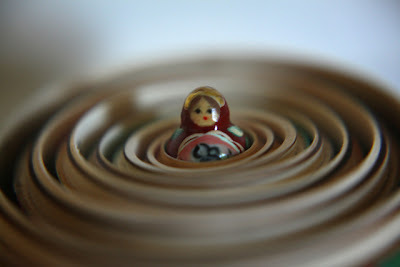 I've seen russian dolls (or matryoshka) everywhere in the last couple of years - fabrics, clothing, homeware, stationery - their rounded shape and intricate patterns seem to translate very well into 2D images and I've had my eye on several pieces of matryoshka fabric for that very reason. But I must say that, for me, nothing beats the stacking dolls themselves and I'm particularly fond of my little set. 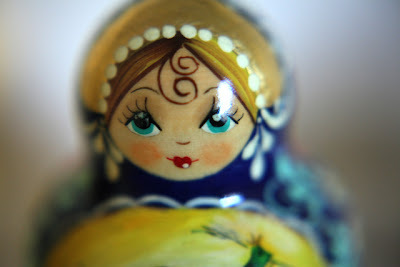 Matryoshka were first made in 1890, they were exhibited at the World Exhibition in Paris in 1900 winning a bronze medal which saw a rapid rise in their production across Russia shortly afterward. Though of course if I had my way I'd have a set of dolls in every room in the house! These are gorgeous! The paintwork is much more intricate than most I've seen - I guess they're probably just cheaper versions. Where are yours from? I'm toying with the idea of starting a proper collection of either russian dolls or snowglobes...maybe both...boyfriend will be pleased! 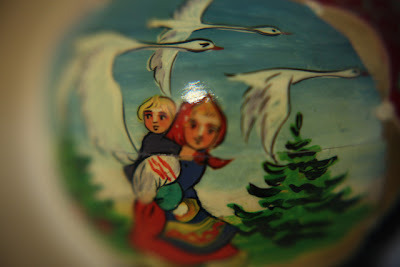 I LOVE Russian dolls! I am really after one now... I must keep my eyes open & ask my friend who does all the car boots!